That's my Plan A entry... with a couple of resin bits still to come. I normally undercoat in black but I've done these in white because I want the final scheme to be quite bright and cartoony. I cant get over how much more detail I can see with the light undercoat! Damn, does that mean i have to colour in all the bit I can now see that i could have safely avoided before? 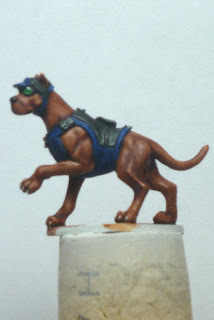 Seriously, either i've rapidly deteriorated in painting skill in the last year since i painted anything or Kev is getting much much better at small detail! My brush feels like a cotton bud (qtip) and i'm looking down the wrong end of a telescope whilst trying to hold the figure still whilst sat on the washing machine during the spin cycle! This should really be in the Colouring in room. Do you use reading glasses yet? You might need them for close work - most of us get there. I already wear glasses /contacts. I'm about a -8 in each eye so pretty much anything beyond a foot away is out of focus for me. I suffer from floaters quite badly too. Good looking crew there. I'll be interested in seeing how this turns out. Do you have a name for it? By the way, what do you mean by floaters. It makes me think your toilet isn't flushing quite like it should. In that case I get some floaters too. I always thought it was just a bit of dust or on my eyeball or something. Goes to show how much I know. Only tiny little things though. "Shortly after Mystery Inc discovered that the Brain Devouring Zombie of Hawkins Manor wasn't Old Man Jacoby the Caretaker in disguise, Velma instigated the 'Shoot First, Unmask Later' protocol." Apologies not the best pictures. I promise my photography will improve. I like the long title but you're probably right about it fitting. Looking at other WIPs will give me a boot up the backside too! Those dogs are nicely painted! That's quick work mine are still sitting in a plastic bag. I'm really interested in seeing now this turns out. It's looking good so far! Can't wait to see how it turns out! The pictures are bothering me though I cannot seem to get the focus on macro setting working on my newer fancier camera. its definately a user problem though! In reality there is a more contrast in the skin and im not sure it isn't too much contrast though... hmmm Perhaps I can always make the final submission pictures blurry too! Not sure its quick work - two figures in a week? i guess that's lightning quick for me. Still have eight figures plus the van plus the display base to do. Depends which side of the fence you sit on ........ taxi for Mr Hughton ? Has t been that long already. Jeepers it'll be christmas eve and I'lll still have the itmes to unpack. Nice scoobs though. 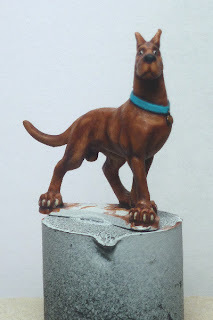 The Scoobys are the dog danglies (half-intended pun). Seems that staying one year off the brushes has done you good, because these look like your best paintjobs to date (excepting your grymn vehicles, but I think painting vehicles and painting minis are two different things). I'm about to airbrush the blue onto this now the masking is on. Wish me luck! Comments, Criticism and suggestions welcome. Great stuff! (worried) The windscreen looks great - is that it's finished state? The windscreen might get a glaze ... It was done with blue-greys but just looks neutral grey. Note : the masking was a disaster! . Thinking of stripping it and trying again. A shame about the masking. I'll be really interested in seeing the mystery machine in all its glory.